The object of Pai Gow Poker is for a player to create two poker hands out of the seven cards in his hand: a five-card poker hand and a two-card poker hand. The five-card hand must rank higher than the two-card hand. The two-card hand is often called the hand "in front" or "on top", and the five-card hand is called the hand "behind" or "bottom", as they are placed that way in front of the player when he is done setting them. The cards are shuffled, and then dealt to the table in seven face-down piles of seven cards. Four cards are unused regardless of the number of people playing. Betting positions are assigned a number from 1 to 7, starting with whichever player is acting as banker that hand, and counting counter-clockwise around the table. A number from 1 to 7 is randomly chosen (either electronically or manually with dice), then the deal begins with the corresponding position and proceeds counter-clockwise. One common way of using dice to determine the dealer starting number is to roll three six-sided dice, and then count betting spots clockwise from the first position until the number on the dice is reached. If a player is not sitting on a particular spot, the hand is still assigned, but then placed on the discard pile with the unused cards. The only two-card hands are one pair and high cards. Five-card hands use standard poker hand rankings. The joker plays as a bug, that is, in the five-card hand it can be used to complete a straight or flush if possible; otherwise it is an ace. In the two-card hand it always plays as an ace, except in several southern Californian casinos where the joker is completely wild. On each hand, ties go to the banker (for example, if a player's five-card hand loses to the banker and his two-card hand ties to him then he loses); this gives the banker a small advantage. If the player fouls his hand, meaning that his low hand outranks his high hand, or that there are an incorrect number of cards in each hand, there will be a penalty: either re-arrangement of the hand according to house rules or forfeiture of the hand. In casino-banked games, the banker is generally required to set their hand in a pre-specified manner, called the "house way", so that the dealer does not have to implement any strategy in order to beat the players. When a player is banking, he is free to set the hand however he chooses; however, players have the option of "co-banking" with the house, and if this option is chosen then the player's hand must also be set in the house way. 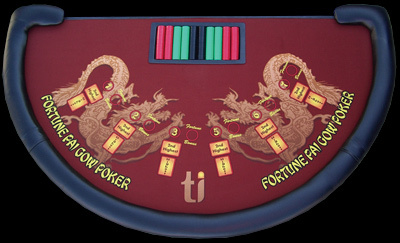 It uses material from the Wikipedia article "Pai Gow Poker".